Most who end up off track when following a problem solving process, go wrong at Step 1 (Defining the Problem). We’re either working on too big a problem, multiple problems or yes, at times even the wrong problem. Of course once we’ve taken enough hits to our bottom line and our own “bottom line” is at risk (if you get my drift) it’s time to get a group together and FIX IT. At the time we call our group together to work on “The Problem”, we’ve potentially already determined the problem statement before we enter the room. Typically, at this point, most stakeholders (those impacted by the problem) have history with “The Problem” and it may have even been reported several times before. All of these reports have a natural bias as the reporting generally has a solution in mind. We tend to do this so we can sow the seed for the fix we already have in mind. It’s a perfectly normal human behaviour but something good problem solvers are well aware of. Many firmly believe they know what’s causing it and what needs to be done to fix it and enter the room with solutions at the ready rather than with open minds for genuine problem analysis. So here we are people! “The Problem” has hit us AGAIN and we’re here to fix it. A line in the sand moment and so the battle line is drawn. We've all heard this before right? “The Problem” is so quickly and easily written up. This step seems so innocent as we're just trying to get started. And immediately after that fleeting moment in time, our resistance to change, from my experience, is around 50%. Just to clarify, at 100% we will die in a ditch before surrendering. As humans, we don’t like to be wrong, so once we’ve documented “The Problem” in any form (be that on flip charts, email, text or even verbal, or we've been told from higher what "The Problem" is) as we believe our pride, reputation or position are at stake. We duly fill out the other details outlined in Step 1 and the group reaches consensus. Our RCA process has 12 Steps and I’m stating we’re 50% locked in after only Step 1. Really? Yes, really! Having delivered this training over the years I’ve experienced this phenomenon many times. Onto Step 2 we go with “The Problem” now set from Step 1. We duly follow the process for Step 2 and some snippets of new information come to light along the way. Will we take this in, choose to ignore it or even convince others to dismiss it outright? More brief moments in time where forks in the road are chosen. Naturally, if new information is in line with “The Problem” set in Step 1, AND the solution we already had in mind before we entered the room, we will be on board with it. However ... if the new information potentially means that there may be a different problem than “The Problem”, we may be more likely to NOT act on this information. After all, it could lead to us having to change “The Problem” and that would mean we were wwwwrrrrr ... we all know what Fonzie said, right? For those not old enough .... Fonzie couldn't say the word wrong. So information is documented through Step 2, and once completed, our Resistance to Change moves to around 60%. Yes, from my experience, it goes up that quick. The steps do get a little smaller with each subsequent Step from then on. So if we were to plot Resistance to Change as a “Cumulative Sum” chart, our Resistance to change level may be as high as 90% as early as half way through the RCA process (in our case 12STEPS Root Cause Analysis process). Remember the calls from scientists for years that the world was flat? The Sun went around the Earth? They were all correct until we found out otherwise. Some time ago I helped an organisation (I won't name them) who went right through to Step 8 on a real problem (which in our RCA Rt methodology is building of the Cause Tree), before realising they had an issue with “The Problem”. At this point the group was having trouble getting valid potential causes to fit the Cause Tree. I asked one simple question and the collective eyes looked to the sky like they had seen a shooting star. “We’ve been looking at this all wrong” one stated. I commended them at that point as that was their collective moment in time when they were ready to tackle the resistance to change issue. A key learning outcome had been achieved! They had realised that Resistance to Change was a contributing factor to them pushing on through more steps even though new information was telling them something was not making sense. Of course, we each have our own resistance to change, the group has its own dynamics / consensus / resistance to change, and we have the 'senior person in the room' factor in play, all at the same time. As I mentioned earlier, we may have been told from above what the problem is, and be reluctant to change direction because of this. Many reasons. The moment of truth has arrived when we begin to realise something is not right and there may be a problem with “The Problem” that we so confidently defined in step 1. Yipee! Celebration time! At this point we have had hopefully the right stakeholders together in a room, and spent an hour, or maybe even a few hours, but have reached a major breakthrough in what has likely been a major repetitive issue that has been hurting our “bottom line”. We have just likely saved ourselves from spending copious amounts of money on the wrong solution — again. For goodness sake, celebrate your success! But what about our pride, reputation and position? As a manager in industry for 20+ years, I honestly say I would value both of these more than ever before, and you should be proud of yourselves. What’s the key takeaway? Acknowledge that Resistance to Change is real. However, don’t ever be afraid to redefine “The Problem”, and go right back to Step 1 to start again if there is compelling evidence. Once you break through the Resistance to Change barrier the first time, it will never be as hard from that moment on, and your problem solving will reach the next level. In God we trust. The rest should bring data! 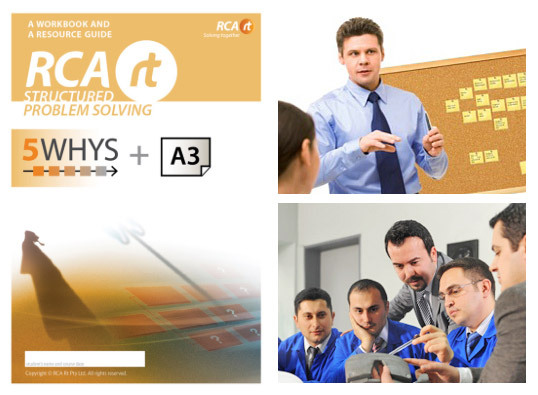 Administrator, developer and editor of the RCA2GO and RCA Rt websites, RCA2GO software and RCA Rt training programs.